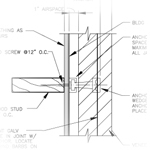 A variety of example details are available here, ranging from customizable details to illustrative examples, addressing many situations for concrete masonry structures. Of course, all generic details must be modified to the specifics of your project and approved by an architect or engineer prior to use for construction. To preview and download the details, select a category or search by keyword.